Inventory We are a resale marketplace, not a box office or venue. Ticket prices may exceed face value. This site is not owned by Golden 1 Center . 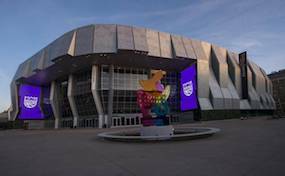 The Golden 1 Center is set to open in October of 2016 to be the new home to the National Basketball Association's Sacramento Kings. The Golden 1 Center box offices will be located at 547 L Street in downtown Sacramento, CA. The facility will be readily accessible from many different methods of public transportation. The project is set to have a $507 million budget and have a maximum seating capacity of 19,000. The first scheduled show is a Maroon 5 concert on October, 15th. Golden1.CenterSacramento.com is not currently affiliated with any primary box office, website, and or supplier. We are an independently owned and operated company that concentrates entirely in the online resale market. Prices on our sites tend to be above face value but will change quickly with market conditions. To order tickets to all Golden 1 Center Sacramento events please follow the process online through the checkout.